Tartangift - Tartan Gifts from Cufflinks to Kilts and more. Suppliers of quality Scottish gifts. Hamish our very own Tartan Teddy. We can supply you with a wide range of tartan gifts Kilts and accessories in your family name from over 120 clan crested items to over 5,000 wool tartans and 80 silk tartans. A wide range of soft toys are also available in your tartan incuding our new Meerkat soft plush toy. We hope you enjoy viewing our range on the following pages. It is an unwritten law that to be Scottish, one must eat haggis every day, have a west highland terrier as a "friend", say "hoots" and "och aye" on an hourly basis, be able to sing every song from Brigadoon word perfect and wear a tartan kilt (even in bed). However, tartan was originally a style of cloth intended only to be decorative. These were patterns that were popular within certain areas where they were woven, and local patterns were achieved using the limited range of local colour dyes (brambles, heather, onions and "midges" can only give so many colour options). They were made of a local coarse type of wool which was guaranteed to afflict the wearer with the infamous 16th Century ailment of "Scottish Sporran Scritch Scratch". This reputedly afflicted thousands more in Scotland than the Black Death. Where there was a strong clan within an area (especially in the highlands where they got really scary! ), visitors from other areas were recognised as being from a different clan by the pattern of their tartan. This caused problems when staying overnight at the local B&B (Bog & Bothy) if you inadvertently left your clan tartan "smalls" out and some local thief/idiot stole your only method of identification. When tartan was proscribed by law, the Government or Black Watch pattern was the only legal one. But by the early 1800s, people realised that the knowledge of tartans before the ´45 was being lost and, simultaneously, everyone got "Romantic" about Scotland's past. They then felt it their duty to preserve all the known tartan designs. These were reconstructed from portraits, collected on pilgrimages (usually to the pub), demanded from clan chiefs, recovered from weaver's notes and special relics were regularly whipped out of granny's bottom drawer for inspection (usually on Saturday nights after Scotsport!). The significance of tartan as national dress, worn under various circumstances, created clan tartans for every "name", even those that previously had none. This was the first "cunning plan" by the Scots to milk a symbol to death in the name of commerce. Hunting tartans of a subdued nature (the equivalent of today's trendy combat wear) and dress tartans that were brighter often supplemented these clan tartans. These inevitably suffered overkill at the hands of such Scottish stalwarts as Andy Stewart, Kenneth McKellar and the White Heather Club (otherwise infamously known as the Tight Leather Club). However, this nickname seemed to refer more to the profuse use of Badger Sporrans and leather G-strings by the male dancers in the group! Further variety was added by fashion, fancy or trade tartans to fill any niche, including various colours of a single pattern, especially the more universal designs used for dancing. There were even some "mourning" tartans developed (usually worn by Scots on days when England were due to play against such great football giants as Jamaica Under 9's and Scotland were playing Brazil in the first round - again!). Nowadays, tartan is a marvellous way of re-establishing ones roots and proclaiming to society that you too are a member of a clan (well, we all want to belong, don't we?). TOP SECRET: Scots have been such prolific pioneers emigrating to other countries over the centuries that we now have huge underground groups and facilities throughout the world. These are ready to spring into action and we should don our kilts in the final world-wide take-over offensive (oops! must just pop off and see my analyst briefly). I hope this short and absolutely factual outline of tartan history answers a few of your questions. We will design your very own tartan at your request in the colours of your choice. A 30 meter sample of fabric will be woven. From the 30 metre sample we can manufacture any of the items from our product range in your tartan at a discounted price. 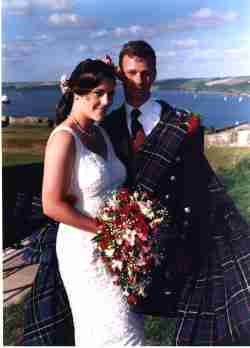 Whether you are planning your wedding in Gretna Green or Alice Springs TartanGift can supply a range of tartan accessories for your Scottish Wedding including silk or wool tartan Sashes and Garters for the Bride. For the Bride Groom Cummerbunds, Bow Ties and Cufflinks can come in a set or individually. Please go to our on-line shop and go to the weddings section. Copyright © 2011 - 2018 Tartangift. All rights reserved.